Got an awesome homebrew you want to share? Going on a picnic and don’t want to lug around a bunch of bottles or cans? We’ve got you covered. Our German made flip-top growlers are high-quality vessels designed to preserve the taste and freshness of your craft brew. German beer growlers are not all created equal. 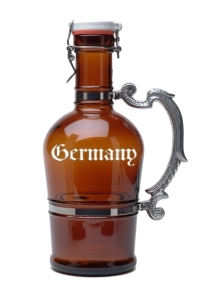 Our classy German Beer Growler is a great way to transport your favorite brew without losing flavor. An ergonomic design makes it easy for you to carry a generous portion of your favorite brew all the way home. So fresh you'll flip - the flip-top lid on these German growlers keeps your brew fresher longer than a screw-top! The flip top lid on our glass growler has a porcelain top and a rubber gasket for a nice, secure seal. Lids with gaskets work much better than screw on tops. We also sell spare beer growler gaskets, just in case yours wear out after years of use. This item is available for laser engraving. What do you give the beer maniac who already has everything? A personalized beer growler! We do all of our engraving in-house. You’ll get a fast turnaround of any message or image you want. How much beer can it hold? Ours holds 2 liters, which is about 68 ounces, just over a half gallon (64 ounces) and just shy of a six pack (72 ounces). How long will my beer last? This really depends on how the growler is filled. If you don’t have a special counter pressure system, filling it so the head reaches the top when closed should keep your beer nice and fresh for two weeks or more. Under optimal conditions, your brew can stay fresh for over a year. Once opened, what’s my beer’s expiration? After you open the growler, you should finish it off within three days, if you don’t just pound it right away. What size is this growler? By volume, it’s 68oz. It’s a bit over a foot tall (13.25” to be precise) and weighs a solid 4lbs. It is quite a sizeable vessel. The stainless steel straps make sure the glass jug is secure, while the aluminum handle cuts down on weight without sacrificing durability. Is it easy to fill? Yes. Our growler has a very wide mouth, making it simple to fill. Cleaning is a snap. Just rinse it out with hot water as soon as you empty it. Turn it upside down and let it drip dry. The locking lever keeping the mouth securely closed is rust resistant. Where is your glass growler made? It’s proudly made in Germany, where all the best beer comes from! Every part of our growler is made in Germany and the manufacturer guarantees the jugs maintain a 4 bar inner pressure. My beer won’t go flat? As long as the growler is properly filled and left unopened, it should not go flat for weeks. Our favorite thing about the growler is taking home tap fresh beer and enjoying it where and when we want, even weeks after the jug was filled. The only way to improve on a flip top growler is to personalize it with an engraved message or picture. Whether you purchase a stock, glass beer growler or have it customized, you’re sure to have a great way to transport your beer. Stop debating if you should get one. The only question you need answered is what to engrave on it and what beer to put inside! Shop all the German beer themed gifts for sale from German Steins! Check out our entire collection of personalized beer mugs.